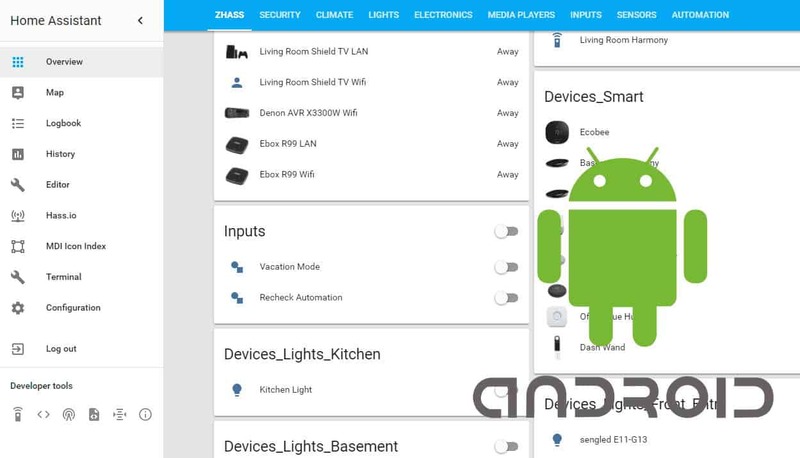 Home Assistant (HASS) one of the best open-source home automation platforms available today, other than maybe OpenHAB. 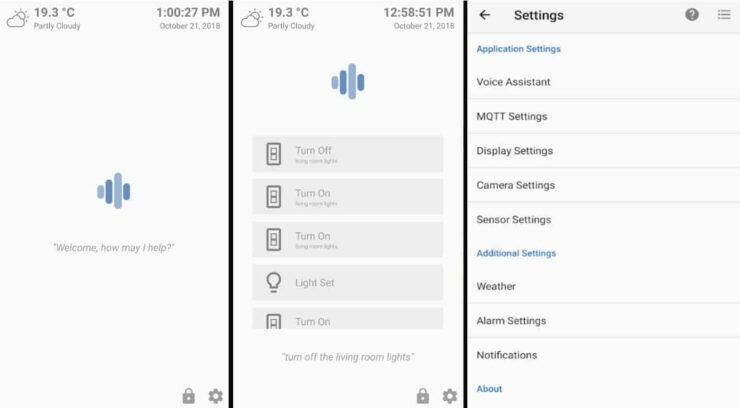 This python based smart home automation platform integrates with over 1000 services and components, making it significantly more versatile than commercial smart home hubs such as SmartThings, Wink, or Vera. However, one of the biggest drawbacks of Home Assistant is the lack of mobile-friendliness. Commercial hubs tout user-friendly mobile apps that make things very simple. Even OpenHAB has an official mobile app. HASS, however, relies on mobile-friendly WebUI. 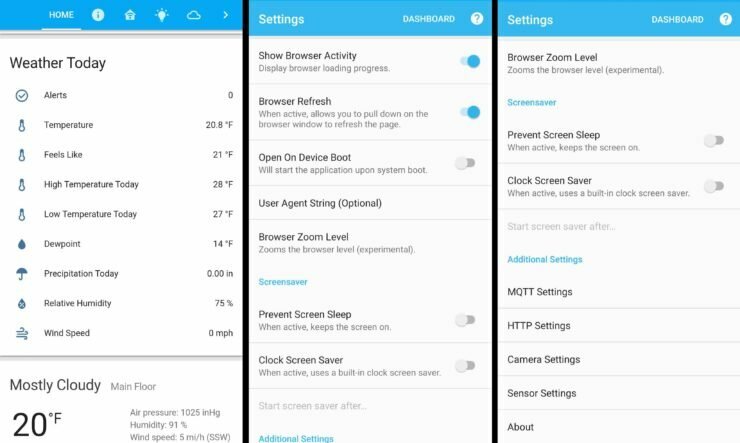 If you have a lot of components or run your HASS on low-power devices such as Raspberry Pi, the web interface lag on mobile devices can be quite annoying. Enter these awesome Android apps for Home Assistant, life gets simpler. So obviously, there are some good Android apps for HASS. But why would you want to use them? Personally, I use them because they are a lot simpler to use than opening the WebUI on mobile phones. I run my home assistant on Docker and on an AMD 5350 based Ubuntu Home Server. Even with a relatively good server and new Pixel 3 phone, the interface was laggy. So there is one reason to use mobile apps to control Home Assistant. There is another angle to this: Dashboards (eg. HADashboard or Tilepanel). Dashboards are modular interfaces for Home Assistant that are intended to be on wall mounted devices (eg. Tablets). These can act as control centers for your home. In the past, setting up Home Assistant dashboards was not a task for the light-hearted. I would say, this is still true. But just as new HASS Android clients have come up in recent times, so have dashboards for Home Assistant. I started using HASS in December of 2017. I was so fascinated by it that I decided to rebrand my whole website and cover more on Smart Home topics, especially Home Assistant. At that time there was only one mobile app available for Home Assistant – HomeAssist. Over the last few months, several new Android home assistant clients have come alive. In this post, I will share my experience on some of the Android Apps for Home Assistant. Note that, this is area is seeing a lot of active development. I will try my best to keep this post updated with current information. These apps should work for any version of Home Assistant, including HASS.io Hass OS. Right of the bat, let me tell you that today, this is the best Android Home Assistant client. I loved it and did not hesitate to upgrade to the ad-free version to support the development. The developer appears to be extremely active and responsive. After opening the app and connecting using your HASS URL, username, and password, the app takes a few minutes to load up the UI icons. After the first start, this was one of the slickest HASS Android apps that I have used. Not only is it bright, colorful, slick, and simple, it is also one of the most featureful apps. Build-in MQTT client that can send phone status (battery, wifi status, location, etc.) to Home Assistant for automation based on your phone status. Ability to create widgets of favorite sensors / switches etc. Unlike, most other Android apps for home assistant, Ariela supports the new Lovelace UI. However, at this time only limited support is available for custom cards. 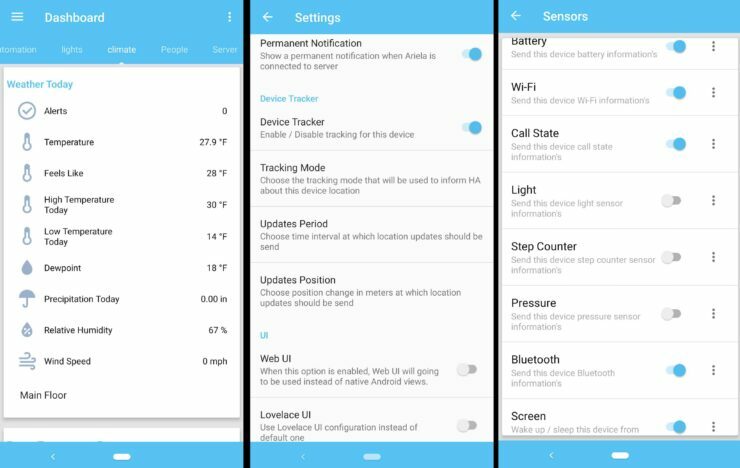 Ariela has a built-in device tracker based on GPS / Wifi, which can be integrated with Zones on HASS for location-based automations. Therefore, the is no need for separate apps such as Owntracks for this purpose. Ariela is actively developed and you can follow its updates in this community thread. Ariela Pro is a separate app. When I paid and moved to the ad-free version, there was no way to import settings from the free version. I had to set it up all over again. It took only about 5 minutes though. Does not show the default Home view. Ariela is my favorite app for viewing and controlling Home Assistant on my Android phone. WallPanel is my second favorite mobile client for Home Assistant. The app's name is more indicative of a dashboard use. But it works great as a mobile phone app. It is an open-source Android application for web-based dashboards and home automation platforms such as Home Assistant. While it can support other automation platforms, the primary platform appears to be HASS. Camera support for streaming video, motion detection, face detection, and QR Code reading. Google Text-to-Speech support to speak notification messages using MQTT or HTTP. MQTT or HTTP commands to remotely control device and application (url, brightness, wake, etc.). Sensor data reporting for the device (temperature, light, pressure, battery). Streaming MJPEG server support using the device camera. Like Ariela, WallPanel also supports exporting device conditions such as battery percent using MQTT. However, it has a few other unique features. You can partially control your Android device using MQTT. It is also possible to livestream your mobile phone camera to home assistant. In essence, you can make your mobile phone act as a security camera. These unique features make WallPanel one of the best Android Home Assistant clients. If these features are important to you, then WallPanel may be a better option than Ariela. WallPanel is my second favorite Android app for Home Assistant. HomeAssist was (I think) the first available Android client for Home Assistant. I used it for several months. It has a bright, colorful, simple, and highly customizable interface based on material design. Apart from being a great mobile app for Home Assistant, HomeAssist is also an excellent choice to setup a dashboard with ease. Problem with HomeAssist is that the last update was in February 2018. A lot has happened in the HASS world since then. One of the biggest changes being the move from a legacy API password system to a full-fledged user-based authentication system. The new authentication system is not supported by HomeAssist and therefore you will have to leave legacy API password support enabled on Home Assistant for this to work. No advanced features – device tracker, MQTT sensors, etc. At this point, I am leaving HomeAssist as the third choice. However, if the app is not updated and does not support some of the newer features of Home Assistant, I see this being moved down the list or even not recommended. Update (January 15, 2019): A new app (HomeAssist-ng) based on HomeAssist is now available. Although it allows token based authentication, some users have reported problems logging in. HomeHabit (formerly known as Project Rotini) is designed to be a dashboard and therefore works very differently than some of the apps listed above. It is currently in Beta. HomeHabit smart home dashboard allows you to connect and control several popular platforms including Home Assistant and OpenHAB. Experimental support is available for Domoticz, Vera, and Wink. 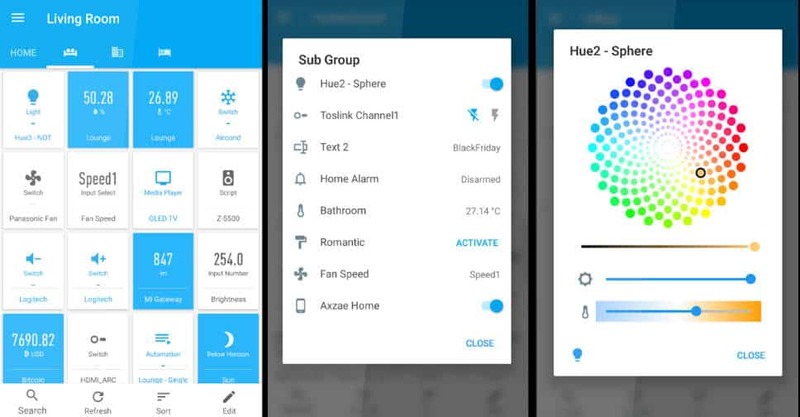 When looking at HomeHabit as an Android app for Home Assistant, some of the likes and dislikes listed below will have to be considered in the light of this app's primary purpose, which is to provide a Home Assistant dashboard and not a mobile client. I am listing it here as HomeHabit works on Android devices. However, this would not be my choice for controlling Home Assistant with Android phone. Voice Panel allows you to control or check your alarm system, lights, windows, blinds, switches, check status, and weather among other things. As you can see, some advanced features (eg. MQTT device conditions, camera streaming) are included as in Ariela or WallPanel. Voice Panel is currently an early release and still being worked on. As already mentioned, my favorite HASS client is Ariela with WallPanel being a close second. HomeAssist (or HomeAssist-ng) is a distant third. HomeHabit and Voice Panel target a completely different experience and they may be better suited as a Home Assistant dashboard than mobile app. If you are interested in a dashboard, then there are several more options than HomeHabit or Voice Panel. These will be covered in a separate post. There are several more awesome things available for use with Home Assistant. Awesome Home Assistant is a great resource to follow and keep track of things you may want to have in your setup. For now though, I hope this list of Home Assistant compatible Android apps was helpful to you.